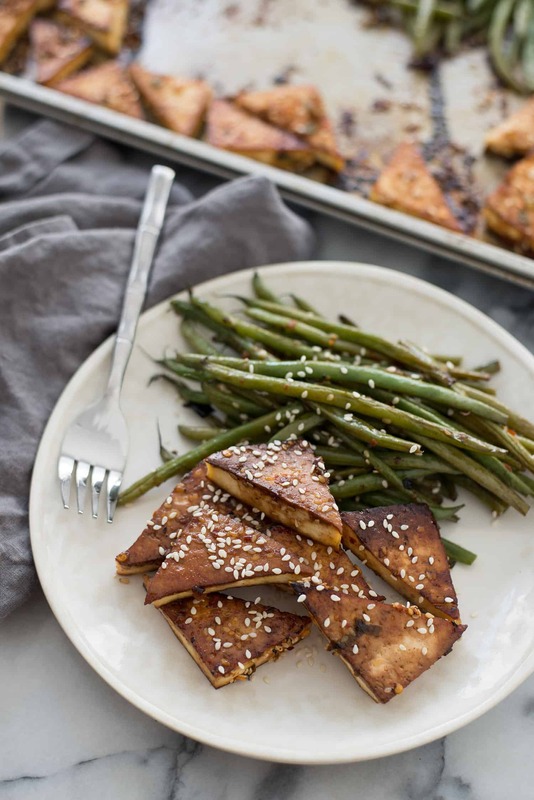 Sheet Pan Spicy Tofu and Green Beans! You are going to love this one pan meal. 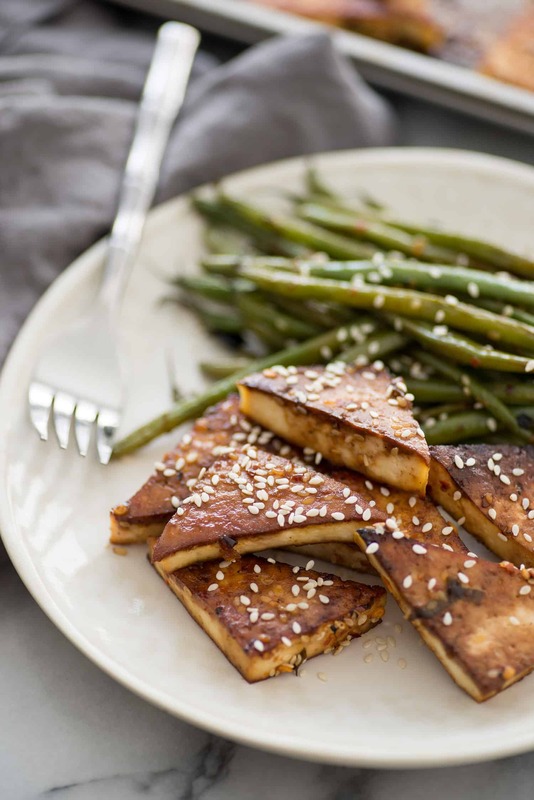 Spicy tofu with crispy green beans. 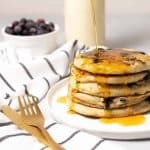 Vegan and Gluten-Free, a must-make! Sheet pan dinners! I’ve been seeing this trend for a while now and I don’t know why it’s taken me so long to hop on. Um, this couldn’t be easier. Whisk together a sauce, bake the tofu, add the vegetables and DONE. Done, done. 1 bowl, 1 pan. Hello weeknight dinners, I’m ready for you. Obviously, I love tofu. Along with beans/lentils, it’s my favorite plant-based protein and one that I wish everyone would eat more of. It’s low-fat, cholesterol free and has a better carbon footprint than animal proteins. Plus, it’s cheap. I can get a 16 ounce package of organic tofu for $1.99, a steal for 4 servings of this yummy dinner. But, I know not everyone loves tofu the way I do. It’s why I created this primer on how to cook tofu and why I often find myself on the tofu soapbox, preaching about how versatile and healthy it is. The biggest complaint I hear is taste– if you cook tofu wrong, you aren’t going to like it. It’s not as forgiving as chicken may be; soggy, flavorless tofu isn’t my cup of tea either. There are secrets. The first is that you must press it. You can be fancy with a tofu press (I love this one, worth every penny), or wrap your tofu in a few towels and place a heavy object on top. 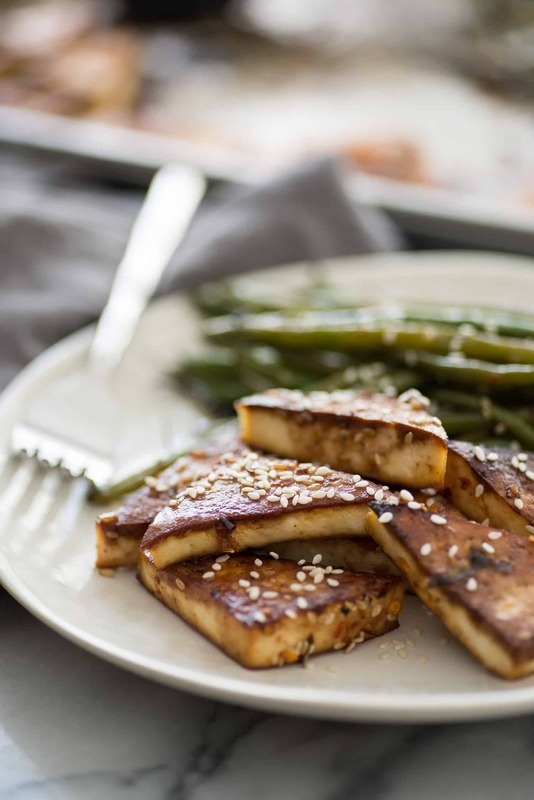 Imagine tofu like a sponge, you have to get the excess water out so the yummy marinade can go in. 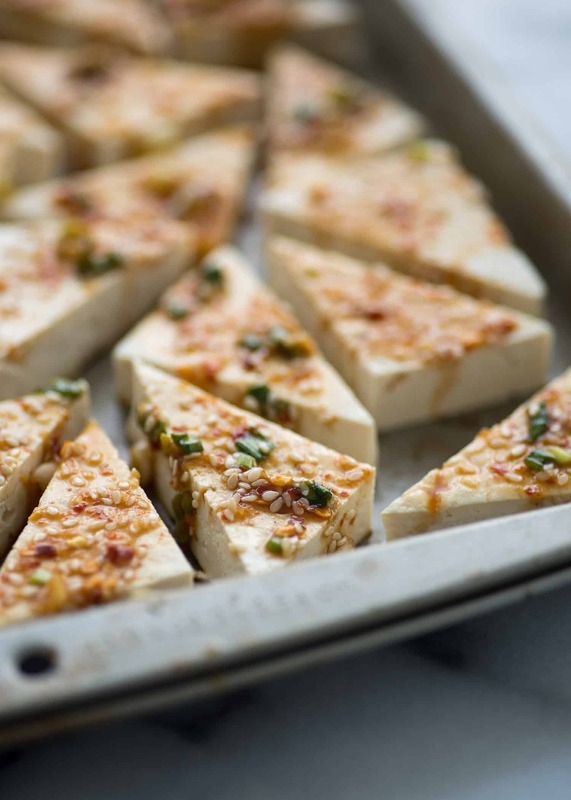 The other secret is to bake it, this dries out the tofu creating a chewy texture that’s so good, you may forget you’re eating soybeans. Maybe. The lack of flavor is actually tofu’s best quality, it’s the perfect canvas for slathering on delicious marinades and sauces. If your sauce is good, the tofu will be good. And this spicy sauce is so, so good. Spice addicts, you’re going to love this one. If you’re a little nervous about an entire teaspoon of dried pepper flakes, reduce the amount as needed. 1/4 teaspoon-1/2 teaspoon would be perfect for those who prefer to eat without having to blow their nose or refill the water glass 10,000 times. For fellow how-spicy-can-you-make-it-weirdos like me, whose dining experience isn’t complete without a healthy amount of forehead sweat, I’ve got you. Though I call for red pepper flakes, if you can get your hands on thai red pepper flakes, use them here. I pick mine up at an asian market in town and it’s one of my favorite seasonings. I love crispy, roasted green beans, especially with a spicy asian-inspired sauce, so that’s what I decided to use. Of course, feel free to sub in any vegetable you’d like: broccoli, peppers, cauliflower, kale would all be great here, though you may need to adjust cooking time. Can we celebrate again that this entire meal is ready with just ONE pan. Gah, I can’t even. Since I usually spend at least 15 minutes post-dinner washing dishes, this kind of meal makes me so happy. Enjoy! Rinse and drain your tofu, then press using a tofu press or wrap in paper towels and place heavy books or pan on top. Let drain for at least 10-15 minutes, this will help the marinade be absorbed. Whisk together the ingredients for the spicy sauce. 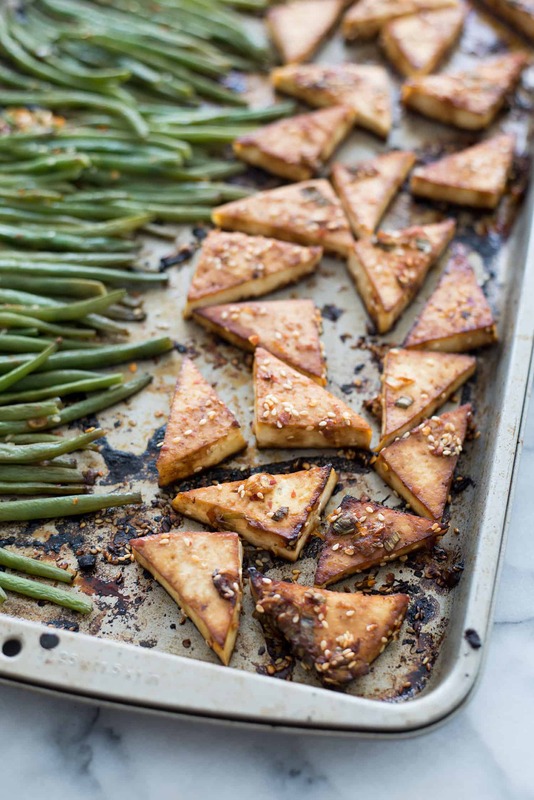 Cut the tofu into triangles and place in a single layer on a oiled baking sheet. Drizzle with the spicy sauce then bake for 12 minutes. Flip tofu and drizzle with more sauce. Add the green beans to the other side of the pan in a single layer, as possible. Drizzle with remaining sauce and sprinkle with salt and pepper. Return back to the oven and bake until tofu is browned and slightly crispy, about 12-15 minutes. Sprinkle with remaining sesame seeds, if desired, and serve. Mmmm, this looks great! I love marinating and roasting tofu, gives it such a savory flavor. Not to mention the amazing texture! I’ll be giving this a try! Soy sauce is not gluten-free, but tamari is a good GF substitute. Yes! Thanks for the reminder Linda. I’ll update it now as well. Hope you enjoy this one! It’s one of my favorites. Hello! I’m excited to try this out, but I was wondering how it would be if I used frozen green beans? Would I need to put them in the oven earlier? Hi Hillary- not sure, as I haven’t used frozen green beans before. I would worry that they wouldn’t crisp up the same way that fresh ones do (as they will lose water as they cook). I’d recommend thawing them first, then making the recipe as written, keeping an eye on the green beans. Let me know if it works using frozen! which tofu press do you love? your story says “this one is worth every penny” but I can’t see any details. How long will this keep in the fridge? 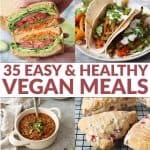 I am planning to meal prep with a meatless meal for the week and this looks like it would have leftovers for a lunch too. It should keep for 3-4 days in the fridge. Thanks!